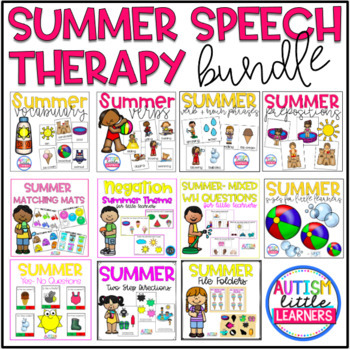 The vocabulary activity includes 12 summer themed pictures (one set using clipart with the written word, one set using clipart with no written word and one set with real pictures). 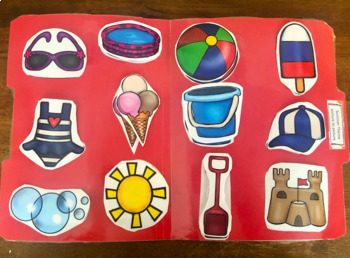 The pictures are: bubbles, swimsuit, ice cream, beachball, popsicle, sun, pool, bucket, sunglasses, sandcastle, shovel and hat. 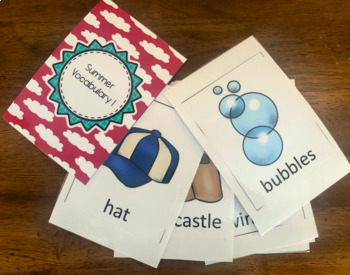 These can be used for expressive labeling and receptive identification of the summer themed vocabulary. A visual communication board is included for children who have limited verbal skills. The pictures can also be used to create file folders for matching picture to picture, real picture to clipart and word to picture. Data sheets are also included. digging, camping, blowing, driving, throwing, building, surfing, grilling, swimming, sliding, running and splashing. These can be used for expressive labeling and receptive identification of the summer themed verbs. A visual communication board is included for children who have limited verbal skills (so they can be used to label the verb flashcards). The pictures can also be used to create file folders for matching pictures to pictures. Data sheets are included. The prepositions activity includes 4 sets of pictures depicting 5 prepositions (on, under, behind, in front and next to). These can be used for expressive labeling and receptive identification of those prepositions. The pictures can also be used to create file folders for matching pictures to pictures. Data sheets are included. The size activity includes 12 summer themed pictures in 3 sizes. The can be sorted into big, medium and little (or small). 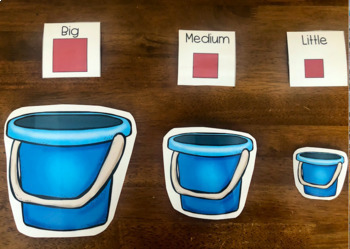 A visual with the words: big, medium and little is also included.